The rivers of Sparta run red with blood. The oceans of Greece are filled with the floating corpses of Athenian warriors. The citizens in the streets of Boeotia cower and flee when they see me coming, for my hands are stained vibrant crimson. A legion of men and women have met my blade, and the end to the killing is not yet in sight. For I am Kassandra of Sparta; Misthios, Eagle-Bearer, the West Wind. And I bring chaos. Not that I actually seek out destruction and violence. In fact, I largely play Assassin’s Creed Odyssey as a flirtatious and sassy mercenary of the people. Unfortunately, though, almost every decision I’ve made across 75 hours of Odyssey has led to spectacularly disastrous conclusions. And that’s part of why I love it: rather than being an epic poem akin to its namesake, Assassin’s Creed Odyssey is in fact an interactive Greek Tragedy. Without spoiling anything, let’s just say I got the worst ending possible. There was a lot of blood, and Kassandra is going to be suffering for it for the rest of her (almost certainly miserable) existence. I’m the kind of player who will do everything they can to lock in the best finale so this was a big change of pace for me. But rather than feeling cheated, it felt as if everything had fallen into the right place; as if I were part of a grand theatre production directed by people in togas. Choices backfired, the drama built, and I was left crying to the gods on a mountainside. The only time this has happened to me before is in The Witcher 3. I’ve previously written at length about how Assassin’s Creed learned many lessons from CD Projekt Red’s RPG behemoth, but it’s in Odyssey where these design decisions truly mature. It’s apparent in more than just depressing finales, too – like The Witcher, even Odyssey’s most mundane side-quests are wrapped up in narrative blankets that prevent the game from feeling like a checkbox-ticking exercise. There’s also the sense that this is the first Assassin’s Creed to truly let loose. 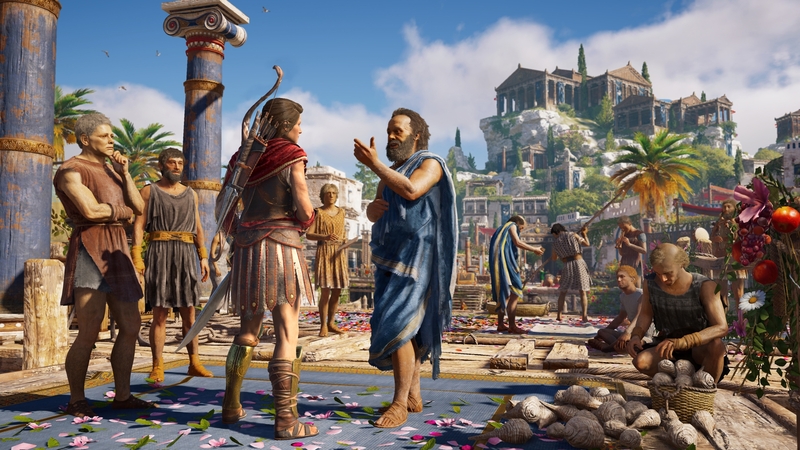 While the core storyline is a blend of traditional Ubisoft bobbins and grandiose Greek traditions, the individual components are more colourful and less po-faced than previous games in the series. Socrates proves an entertaining questmaster, loading each mission with a philosophical lesson written with a knowing wink to how ridiculous it is in the context of a videogame. Alkibiades is a shameless horndog whose quest to bonk every sentient creature in Greece is even more ambitious than my own. There’s a distinct pivot in tone towards gleeful entertainment and the game’s all the better for it. But Odyssey’s greatest triumph is how it weaves these narrative features into a beautiful and systems-heavy open world that never leaves you wanting for something to do. It’s pitched at just the right level: it doesn’t have a bewildering number of activities, but there’s more than enough to ensure dense variety in every play session. And it’s all arranged in such a manner that 100% completion feels achievable, and – importantly – enjoyable. Plus, there’s the all-important allure of an endgame that allows Ancient Greek mythology to really come alive – Medusa battle and all. With such a compelling word and a deeply likable cast, it’s no wonder that I’ve now spent twice as much time in Odyssey than Origins, and don’t plan to stop there. With episodic DLC set to continue the story and take us to the lost city of Atlantis, there’s plenty more time to be spent with Kassandra. And with that, it looks like Ubisoft has finally made an Assassin’s Creed that bests Black Flag. That’s no small feat, and is why Odyssey is my favourite game of 2018.